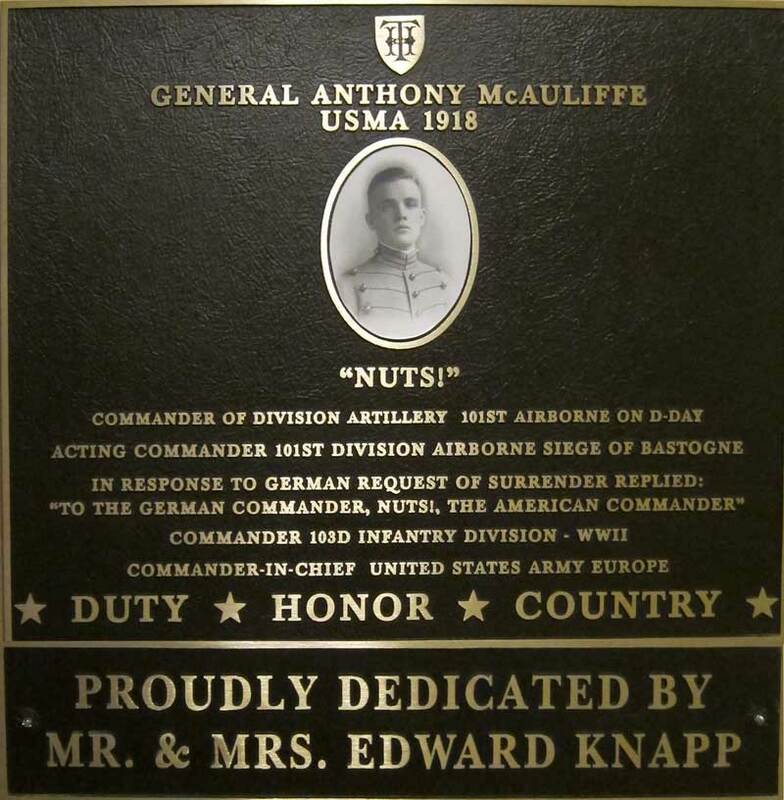 It is rare that after a lifetime of service to a nation one person's life can be universally synonymous with one word- but Anthony McAuliffe's life will always be remembered and associated with one word: "NUTS". It certainly is ironic after many of the decisions that this brave man made- going to West Point as a young man, joining the paratroopers when it was just a novel concept, and leading America's Army in combat in one of its biggest battles, and rising to command all of US Army European Forces, that he is forever remembered by the word: "NUTS." But he probably wouldn't want it any other way. It wasn't his state of mind- but his gut reaction as a soldier that immortalized the word and himself in American military history. That word spoke volumes about not only the character of the man that was Anthony McAuliffe, but the men that made up the Screaming Eagles in World War II, and that is why both he and the 101st Airborne will always be immortalized with that word. ​Soon surrounded by superior numbers of German armor units, the 101st paratroopers joked that that was exactly what they trained for: to be surrounded by the enemy. With cloud cover preventing allied air cover from supporting their efforts the airborne were attacked by armor, artillery and infantry divisions. Outnumbered and undersupplied they fought on day and night. When the German commander sent in a team under a white flag to request the 101st surrender- the acting division commander BG Anthony McAuliffe's initial reaction to the request for surrender was "nuts!". His staff convinced him to go with his initial reaction- and his reply was "to the German commander from the American commander: Nuts!" It was both brazen and slightly with a sense of gallows humor said defiantly in the face of overwhelming odds as 101st soldiers were dying by the hour. When the battle was finally won and the heroes of Bastogne and their sacrifice was recognized, one word echoed around the free world "nuts!". The family of General McAuliffe provided a copy of the German request which is now displayed in the McAuliffe room at the Thayer Hotel. Anthony McAuliffe was born in Washington, DC in 1898. He started college at West Virginia University in 1916 and then entered West Point in June 1917. Because of World War I the class had a shortened time at West Point and he graduated in November 1918 to deploy to the France to fight in what was then called "the Great War". Before they deployed however, Germany surrendered and his class was ordered back to West Point to finish their schooling finally graduating in 1922. They missed the "War to end all Wars" but nearly twenty years after their second graduation, the class of 1922 would find themselves fighting the second great war, now called World War II. Between the wars he rose through the ranks during the post-war years and entered World War II as a Colonel. He parachuted into Normandy as the Commander of Division Artillery for the 101st Airborne and later landed by glider in Operation Market Garden in the invasion of Holland. He'll forever be known for his leadership during a critical moment in time in the biggest battle the US Army had ever fought in the Battle of the Bulge in December 1944 when he rose to the occasion and commanded the brave paratroopers of the 101st Airborne Division surrounded by Germans at Bastogne. After the Battle of the Bulge BG McAuliffe was promoted to Major General and given his own division: the 103rd Infantry Division which he commanded throughout the remainder of the war. After the war he held many positions rising up to command the Chemical Corps, Army G-1, Commander of 7thArmy and eventually Commander in Chief of US Army Europe. He retired in 1956. The new headquarters of the 101st Airborne Division at Ft. Campbell is dedicated in his honor. The Alumni Association of the 101st Airborne is appropriately called The McAuliffe Chapter. This room is dedicated to the life of General Anthony McAuliffe and to the soldiers of the 101st Airborne, many of them who made the ultimate sacrifice for our country in World War II, Korea, Vietnam, Iraq, Afghanistan and continue to defend America as the men and women of the "Screaming Eagles".